are not the measure of growth. 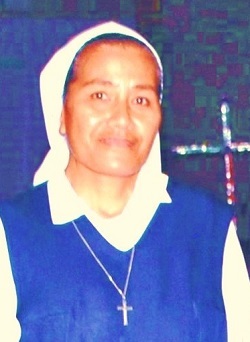 Sister Malia Soane was born 6 June 1963 at Mata-Utu, Hahake, Wallis, of French nationality. Daughter of Atelemo KOLOKILAGI and Soana Falakika FOIMAPAFISI. Baptised on the day of her birth, 6/06/1963 and confirmed 14/12/1974. The eldest of 8 children - 4 girls and 4 boys. 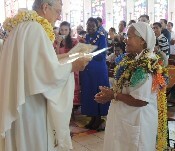 Sœur Malia Soane began her formation as an SMSM as a postulant at Mont-Mou, in New Caledonia 23/12/ 2007. 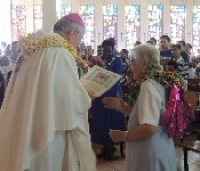 She then began her novitiate in Sénégal on 19 October 2008 at Keur Aleka, Dalifort. With four companions from Oceania, she made profession 9 October 2010 à Dalifort, in the Daniel Brottier chapel. 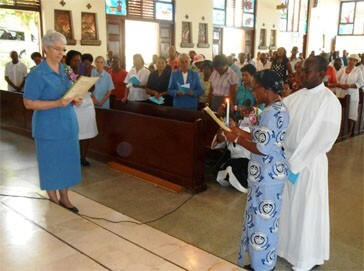 Immediately after profession, she was called to give community service in New Caledonia, at Rivière Salée. 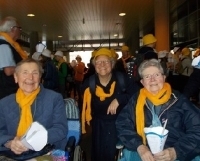 As a missionary ready to go ‘wherever we are sent by the Congregation’, Sr Malia returned to Senegal. From January-July 2014, she helped at the Centre de Promotion Féminine in Guédiawaye where her discreet presence and humble service was appreciated by both teachers and students at the Centre. From August to December 2014, she worked with the team looking after street children at Grand Yoff. But her work was cut short by illness. 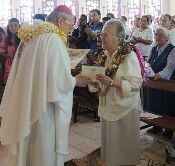 Aware of the seriousness of her illness, she had the courage to ask to make her perpetual vows, which he did with great joy on 8 December 2014. 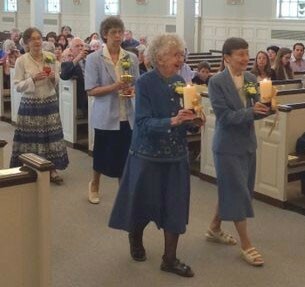 From that time onwards, she lived the mystery of Calvary. For our dear Sister Malia, the Pascal Mystery, lived with a deep peace, continued for three years. Malia Soane had chemotherapy, with the highs and lows of that treatment, but many of us noticed that Malia had an unshakeable faith in her Lord to whom she had consecrated her life. In the midst of her trials and suffering, she always had a smile for those who came to visit her. She was far from her family in Wallis, but she asked them not to worry about her. One of her brothers came to visit her less than a month ago. This was a great joy for Sister Malia to see her brother coming to Africa to visit her, fully aware that it was an Adieu, as she was becoming very weak. Sister Malia returned peacefully to her Lord on the morning of 12 May 2017. She is the first SMSM buried in Senegal, her country of mission.